Our 6,000-lb. capacity, triple-wide parking lift turns a three-car garage into a six-car powerhouse without making your space look clunky or cluttered. No columns split between the lift decks, which makes this independent platform-style car lift one of the slickest vehicle stackers money can buy. 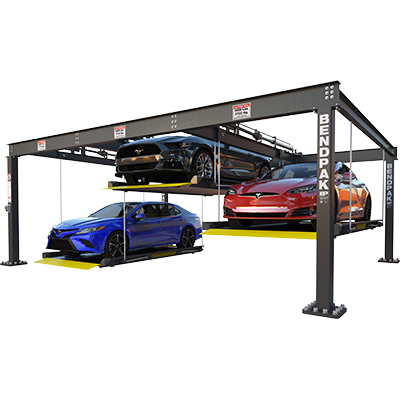 The PL-6KT triple-wide parking lift is one of the most efficient parking units ever designed. The key to its design is a streamlined, four-column structure that leaves all three lifting platforms free from surrounding posts, making it safer and easier to enter and exit parked vehicles. This car lift is equally useful in large residential garages and commercial spaces. Municipal parking lots and custom shops looking for extra parking don’t need to waste money buying multiple lifts that may or may not even fit in their space. A triple-wide lift is the most efficient way to turn three parking spots into six. If you’re in need of a lot of extra parking, your first instinct may be to buy multiple parking lifts. However, the smarter bet is to order a BendPak triple-wide, independent platform lift. These unique lifts house six vehicles for long or short-term storage. It’s much more space-efficient to buy one extra-wide car lift than it is to buy three smaller ones. Each platform will lift and hold up to 6,000 lbs., so a total of 18,000 lbs. can be loaded up at a time. Three full-width, galvanized steel platforms cover the length and width of this car lift. Resistant to oil, weather and abuse, these decks will easily last the lifetime of your unit. Each platform moves independently of the other two, which means more vehicles can be stored without rummaging through the entire bottom row just to get to one raised vehicle. The PL-6KT is a triple-wide marvel that keeps you organized without slowing you down. All hydraulic lifting cylinders and lifting cables are routed internally throughout the mammoth structure of this lift. Clever engineering prevents the extensive network of cables from awkwardly crossing over each other, so the platforms rise and descend safely at all times. The PL-6KT model car lift operates on 110V or 220V power. International voltages are available upon request.